When you're surrounded by the beauty of Door County, it's only natural to want to protect it. That's why many of our establishments are Travel Green Certified, making it easier to travel sustainably. Joseph Zettel began planting cherry trees in Door County in 1896, and the bright fruit has been synonymous with Door County ever since. His trees thrived, and soon there were thousands of acres of them up and down the peninsula, becoming as much a symbol of the region as lighthouses and shoreline. In this month’s special seasonal edition of the Our Door County video series, we take you on a dive into the storied past of the Door County cherry industry. Learn why cherries thrive in Door County’s shallow soils and cool air and how farmers first brought fruit-growing to this narrow sliver of land. You’ll hear the story of an often-forgotten blip in the industry’s past when German prisoners of war saved the cherry crop during a labor shortage at the end of World War II and the days when young boys flocked to Egg Harbor for “cherry camp” each July. The history of cherries in Door County goes far beyond pies and desserts to an emotional connection that spans generations. For decades, thousands of workers were imported to the Door from Texas, Mexico, Jamaica and Haiti to bring in the harvest, bringing their cooking, language, and culture to local residents and workers. That ended when technological advances made picking easy, but versions of those early experiences still evoke feelings in locals and visitors alike. Meet the people keeping cherry traditions alive, and get a look at new innovations taking the industry into a new era. To plan your cherry experience, check out our guide to everything cherry. 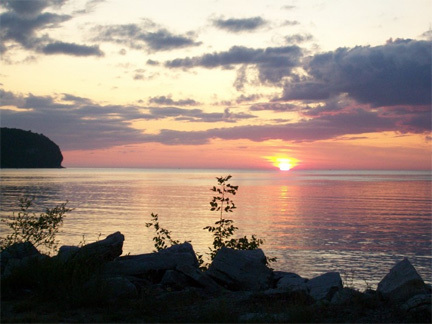 Located in Ellison Bay, Newport State Park's 2,400 acres of wilderness offer 11 miles of Lake Michigan shoreline, 30 miles of hiking trails and prime locations for hiking, swimming, fishing and backpack camping. The largest of our state parks, Peninsula State Park's 3,776 acres offer an 18-hole championship golf course, biking and bicycle trails, a VITA course, camping, swimming and fishing. 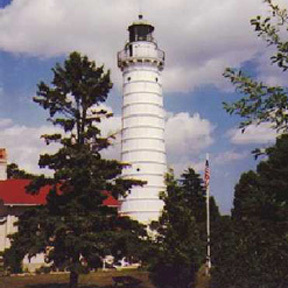 Visit the Eagle Bluff Lighthouse, the Nature Center, Nicolet Beach and Northern Sky Theater all in the park. 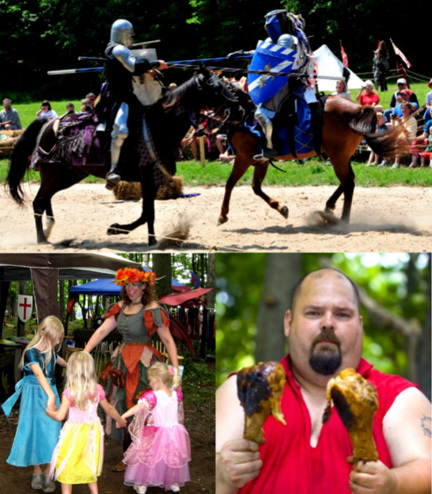 This 1,178 acre park features more than two miles of Green Bay shoreline. 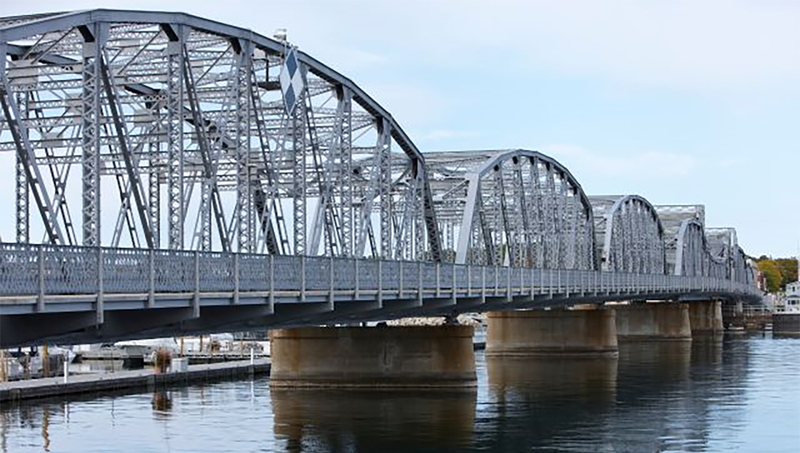 Located in Sturgeon Bay, the park offers biking trails, six miles of hiking trails, camping, an observation tower, boat ramp and fishing hot spots. Visitors can find Rock Island State Park one-mile northeast of Jackson Harbor and Washington Island to enjoy 10 miles of hiking trails, camping, swimming, fishing, Pottowatomie Lighthouse and Thordarson Great Hall and Boathouse. Whitefish Dunes State Park is 867 acres on the rugged Lake Michigan shoreline with a mile of sandy beach and the highest sand dunes in Wisconsin. 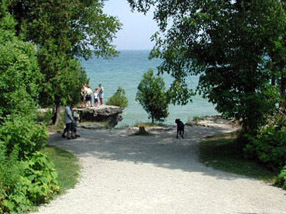 Visitors enjoy swimming, fishing and hiking on more than 14 miles of trails. You haven’t experienced Door County until you’ve spent some time on the water. We caught up with Captain Peder Nelson of Sail Door County to find out why life on the water is so special in Door County, his family’s long lineage on the water, and his favorite spot. Q: How did you end up making a life watching the Door County sunset every night? A: I’m a burned-out inner-city school teacher. I started as a Chicago Public Schools teacher 18 years ago. As soon as I got my job I bought a boat and started my business in the summers. Eventually it got to the point where my heart was more into Door County and my own business than it was in teaching. Q: In 2011 you bought a schooner, the Edith Baker, that is now the most prominent boat you sail. How did that come about? A: I sailed the Caribbean, and that’s when I realized I wanted a bigger passenger vessel. In 2011, I bought the schooner Appledore III after saving up enough money for years. That’s when the business really took off and got serious. I renamed it the Edith Baker after my great grandmother, who sailed to the U.S. on a boat full of people stricken with cholera. She ended up in Sister Bay and lived into her 90s, a real survivor. Q: How did you end up falling in love with life on the water? A: My Dad’s father’s side was all from Sweden and they were all commercial fishermen. Our first family boat was a double ender, a steel lifeboat off a freighter. So one of my first memories was running from our house in Sturgeon Bay and heading out on a steel lifeboat. My dad worked at Bay Shipbuilding after giving up commercial fishing. My dad’s brother was a tugboat captain, so it’s always been in my family’s blood. I started sailing when I was nine years old with the Sturgeon Bay Sail Training Foundation. Q: What’s a day like for you in the summer? A: We start at 7:30 or 8 a.m., getting the boats ready. Our 40-footer runs five sails a day; our schooner runs four sails a day, with about 15 minutes between sails, so there’s not a lot of down time. We watch the sunset with the engine off. It’s really a tranquil experience to have nothing but the sound of the wind or the waves and people’s chatter. Then we fire a cannon right after sunset, strike the colors, bring down the flags and motor in and put the boats away. It’s about 9:30 p.m. by the time we’re done. So it’s long days on the water, but good days. Q: You sail every day, weather-permitting. Does it ever get old being on the water? A: It doesn’t get old. It gets exhausting. But I’ve sailed in Key West, California, up the coast and our scenery here in the bay is better than them all, in my opinion. Q: Why is it important to experience Door County from the water? 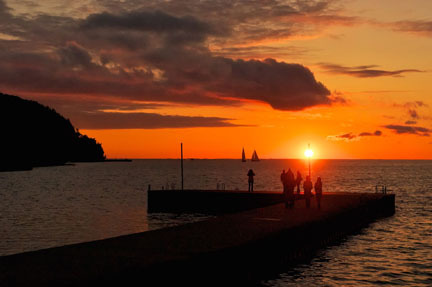 A: I like to say that if you haven’t sailed Door County, you haven’t seen Door County. If you get people on the water, and get them to back up and see how beautiful the place is and the bluffs are without houses and cars. In my opinion, being on the water really helps people to understand that this is not only a fun place to dine, shop and play, but a really special place. I see it as a way to teach preservation and ecology. The Niagara Escarpment is an amazing geological wonder, but it’s a fragile ecosystem. We’re going to start doing that with Gibraltar schools this September. We’re working on curriculum to get kids out to teach them about their own home. Astronauts talk about their experience in the space station and how it instills in them how important it is to preserve it and that we all get along. I relate to that. Our space ships are our little sailboats. Q: As a guy who has sailed all over the Great Lakes, the Pacific, the Caribbean, and so many other places, how do the facilities of Door County stack up? A: The communities of Door County have done a great job at improving their facilities, from docks, breakwalls, to bathrooms and facilities. We now can take bigger boats; we have space for 100-footers. It’s providing the access to people who want to start boating. It’s good development because it’s putting people in touch with the water and giving them access to the water. When you roll up to a place in a boat, you appreciate it more than if you roll in by car. Egg Harbor has done a great job in expanding its harbor. In Sister Bay, the town is blowing up. This waterfront development has actually facilitated the economic revitalization of the whole community. You can get off the boat and walk to amazing restaurants and bars. We have great parks, great marinas. 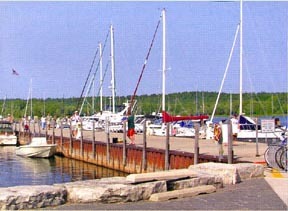 Q: What’s one thing you would tell a visitor that they have to see if they get on the water in Door County? A: What I really love, if I ever have a day off, I really love sailing in the deep water along Ellison Bay Bluff and along the Sister Islands. Those areas are more remote and untouched by building and development all the way to Washington Island. I love sailing next to the bluffs like that. Get tips on where to stay and eat as well as what to do during your stay with the 2017 Visitor Guide. You can plan your eco-friendly trip here and enter to win a free one-night Travel Green stay at Birchwood Lodge in Sister Bay and a $100 Door County gift certificate.